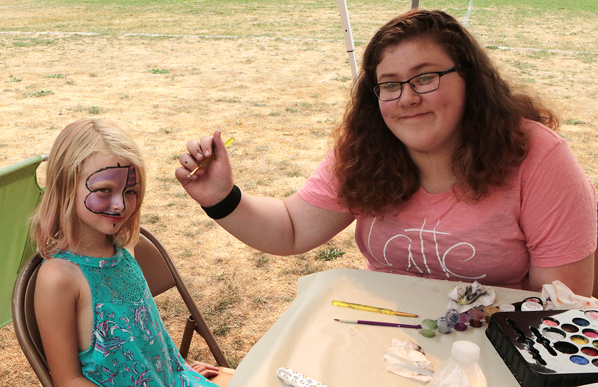 Lents Park is filled with fun, music, and food — when Revolution Foursquare Church presents their annual “Day in the Park”. 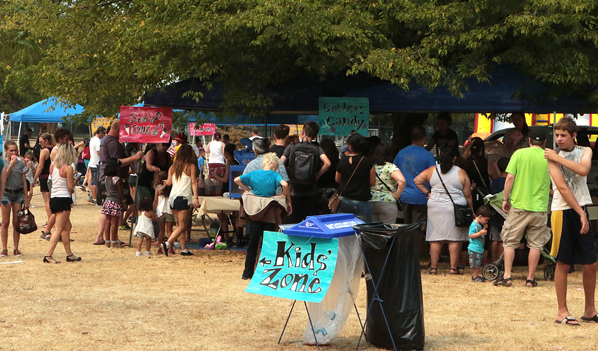 Lents Park became a carnival, music, and entertainment venue, as well as a play area and the site of a hot dog dinner, on Labor Day Monday, September 4. “Revolution Foursquare Church hosts this completely free event every Labor Day and calls it ‘Day in the Park’,” said its founder, Pastor Alpha Hayward. 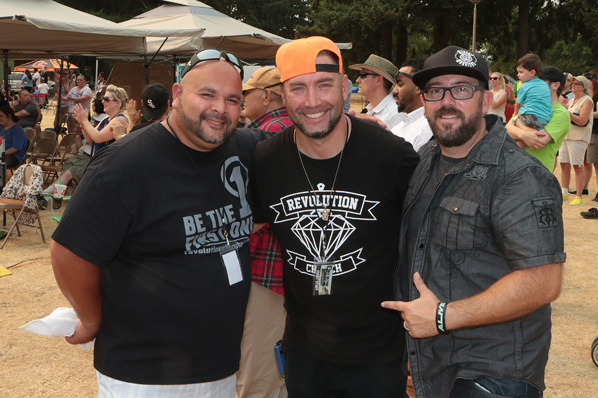 Revolution Foursquare Church Founding Pastor Alpha Hayward spends a moment with the church’s Youth Director, Rob Walker, and Associate Pastor, Tim “Trey” Ray. 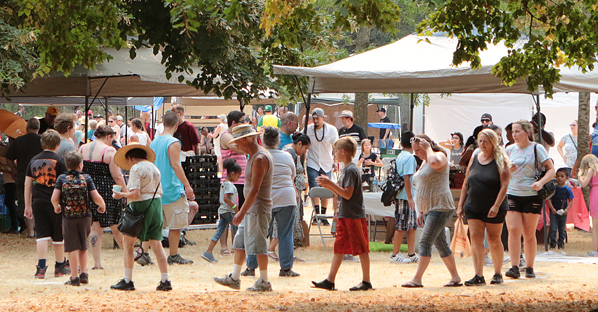 “It’s a way for us to hold a big party for the community, and bless them by providing a free event that gets people together to have a good time together,” Hayward told East Portland News. Observing that the congregation meets Sunday mornings at the nearby Wattle’s Boy’s & Girl’s Club, Hayward said that Lent’s Park continues to be the ideal location for their late-summer community celebration. 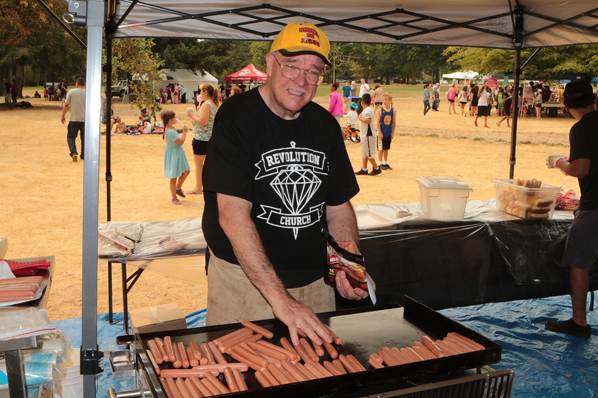 Wiener chef Fred Hammond cooks some of the 1,000 hot dogs served during the event. “We started this, looking to do something fun that brings smiles to people’s faces as we demonstrate welcoming and loving attitudes,” Hayward said. 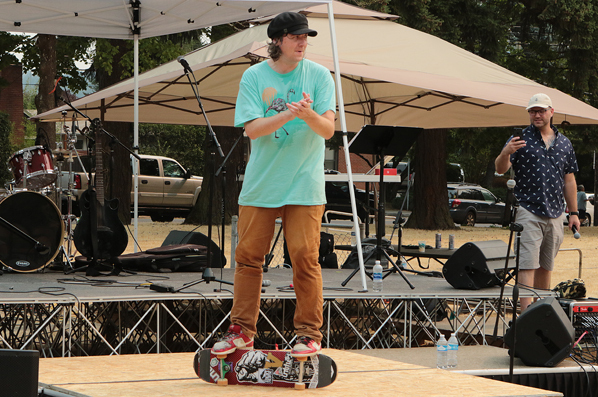 While he spoke, a well-known skateboard rider was demonstrating stunts; to the north, volunteers were holding a cake-walk. Participants hoping to win delicious baked goods are plentiful, as another “Cake Walk” gets underway. Pro skateboarder Tim Byrne demonstrates some of his tricks. “We have about 70 volunteers helping out here today,” Hayward remarked. “Many of them are family and friends from our church, other area churches – some are from businesses. We call, and they come out!” he smiled. Hosting this carnival every year helps carry out the mission of their church, the pastor explained, because it helps them build relationships. “This gives us an opportunity to ‘step outside the walls’ of where we worship, and do something good for someone else – the bonus being that these ‘someone elses’ are residents in our community, and of the greater neighborhood area that we serve,” said Hayward. Meegan Flores gets her face painted by Olivia Waterhouse. 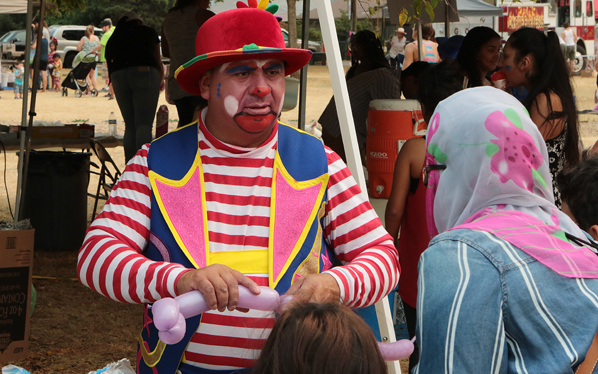 Revenito the Clown twists balloons into toys for eager kids. While it takes months of planning and effort, it’s all worth it to him, Hayward said. “The best part of this for me is being able to see people receive hope, watch as they learn about Jesus Christ, and his love, and receive that love into their lives,” he said. Learn more about Revolution Foursquare Church at their website: CLICK HERE.